The other Sunday I took a walk of penance spanning Bayside to College Point. I walk long distances; this one totaled 10 miles. I walk to reflect on my bad luck and equally bad choices, but also manage to get hundreds of photos in the process, many of which go into posts here and on forgotten-ny.com. One of these days another book featuring the photos will bubble forth (after the two I’ve already written, Forgotten New York and Forgotten Queens) if another publisher wants to put up with my nonsense. Bayside was first settled by the British around Alley Creek, the East River inlet now leading to Alley Pond Park, in the early 1700s. It was first named Bay Side in 1798 and by the time the one-word spelling appeared in the 1850s, it was a small but potent community, giving rise to governmental leaders and statesmen. The neighborhood has always retained a small-town atmosphere centered around Bell Blvd. The street is named for Abraham Bell, and Irish Quaker who was a partner in a shipping firm and owned a vast farm in the area, and has nothing to do with Alexander Graham Bell, who got the first patent for a telephone even though Guglielmo Marconi actually invented the device. In the 1910s, Bayside became a film actors’ colony until the nascent industry decamped to Hollywood. The Famous Players-Lasky Corporation built studios in Astoria that still stand today, and Bayside, separated from Astoria by 20 minutes on the train, became a filmmaking hotbed with D.W. Griffith, in particular, filming hundreds of productions. 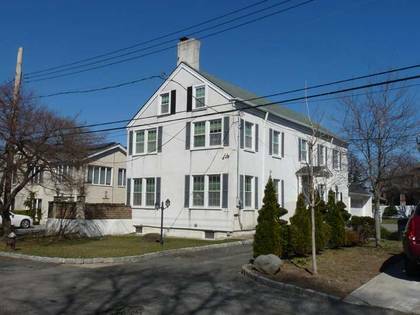 W.C. Fields, Norma Talmadge, John Barrymore and later, Paul Newman all lived in Bayside, which was semi-rural and still has stretches with no sidewalks. I took a short ride on the railroad from my home in Little Neck to the Bayside LIRR station, pictured above. 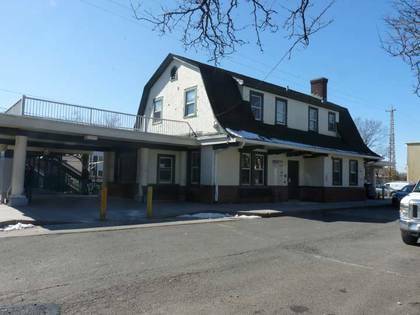 The present Bayside station house is a gambrel-roofed structure dating to 1923. In those days, agents and their families actually lived at their stations; the family quarters were on the second floor. When it was built, the Port Washington branch still ran on the surface, but it was placed in its present open cut here in 1927. A railroad has run here since 1866, when the Flushing and North Side Railroad, operated by Elizur Hinsdale, ran east through Bayside to Great Neck (Port Washington wasn’t reached till 1896). It became a part of the LIRR, and then owned by rubber magnate Conrad Poppenhusen (who I’ll mention again later), in 1876. Though time and real estate developers have robbed Bayside of most of its grand mansions, you still find some relief from ranch and tract houses here and there. 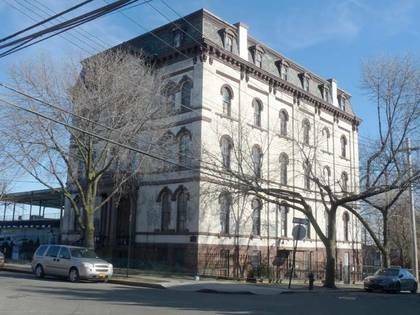 One such is the John Ahles Mansion on 213th St. between 39th and 41st Aves. ; 40th is skipped here. The French Second Empire-style house was constructed in 1873 by Robert Bell for his daughter Lillie and her husband, John Ahles (pronounced “ails”), a wealthy businessman who was well-regarded in Bayside. 41st Ave., in fact, kept its old name of Ahles for years after surrounding streets had gotten numbers. In my opinion, St. Nicholas Russian Orthodox Church, Clintonville St. north of the Cross Island Parkway, is the second-best onion dome in the city, topped only by the Louis Allmendinger Cathedral of the Transfiguration on Driggs Ave. in Greenpoint. But this one’s in brilliant Technicolor blue! 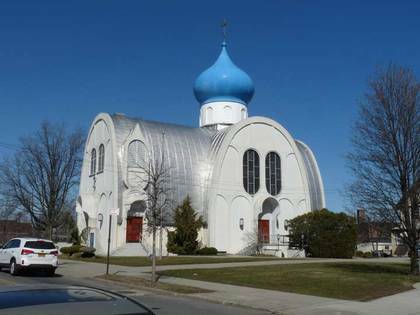 It looks like they stuck the dome on top of a couple of quonset huts, but it works and has become, since its construction in 1969 by architect Sergei Padukow, a neighborhood landmark. There’s been an onion dome on Clintonville St. since 1919, when the first St. Nicholas Russian Orthodox Church was built at this site, now just north of the Cross Island Parkway. Early New York State governor and senator DeWitt Clinton lived in Queens County, primarily during his time as mayor, in a now-burned-down mansion in Maspeth, though he had a summer house in Whitestone. While he was governor, Whitestone became known as Clintonville in his honor. Though the neighborhood became “Whitestone” again during the 19th Century, the name is remembered by the lengthy Clintonville St. and Clintonville Playground. According to legend, Whitestone takes its name from a large offshore rock where tides from the East River and Long Island Sound met; in other accounts the name is in honor of the White Stone Chapel, erected by townsman Samuel Leggett in 1837. One of Queens’ few remaining 18th-century structures is the Colden-Wesson mansion at 2-11 147th St. opposite Francis Lewis Park. It stands within the old estate of the Declaration of Independence signatory, and was built in 1762 and further enlarged in 1926. 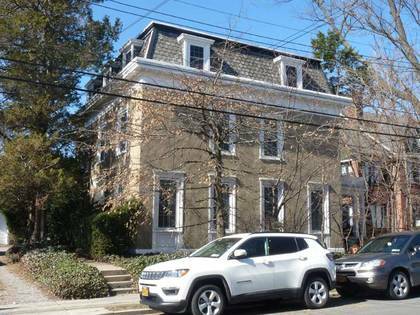 It has been owned by the family of Queens Supreme Court Justice Charles Colden (1885-1960) and later, by the Wesson family. Colden founded Queens College, whose Colden Center (since renamed for philanthropists Selma and Max Kupferberg) was named for him. Francis Lewis Park runs along 3rd Ave. (it’s strange to mention such low-numbered avenues in Queens) between the Bronx-Whitestone Bridge and 147th St. This nine-acre park covers a remnant of the property that belonged to Francis Lewis. The Welsh-born merchant represented Queens in the signing of the Declaration of Independence and his name also appears on a local high school and the north-south boulevard that stretches from Whitestone to Rosedale. Lewis (1713-1802) was a Welsh merchant who emigrated to Whitestone, then part of Flushing, in 1734. In the 1750s he entered politics, serving as a member of the New York Provincial Congress, and was later elected as a delegate to the NY Continental Congress in 1775. His mansion was destroyed by the British the following year, because he supported the patriots’ cause. The city acquired this park in 1937. Its beach is useful for walking, launching canoes and fishing but signs inform visitors that swimming is prohibited. 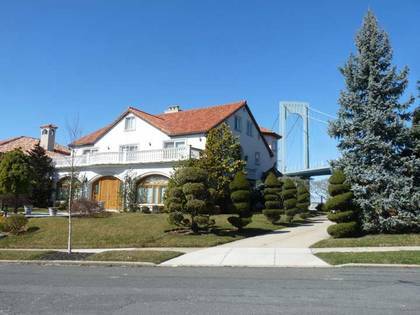 Malba is an upper-middle class enclave in a small, curving network of streets just along the East River shoreline and west of the Bronx-Whitestone Bridge. For many years it was entered through an elaborate stone gate on 14th Ave., which was obliterated by accident when the bridge and its attendant approach roads were built. The contractor hired to pick it up and move it dropped the gate, breaking it beyond repair. Malba was named for the initials of its original investors and founders of its real estate venture, Maycock, Alling, Lewis, Bishop, and Avis. Malba was originally stocked with Spanish Mission-style dwellings, and some of those remain, but Malba and northern Whitestone are quickly being overrun with garish, cartoonish McMansions. 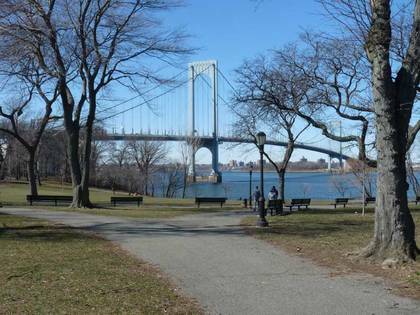 The Whitestone Bridge opened in 1939 and was designed by master Swiss bridge builder Othmar Ammann, whose other major bridges include the George Washington, Throgs Neck, and Verrazano-Narrows Bridges. Originally, it didn’t cut a major swath through the region, but the surface Whitestone Parkway was expanded into the Whitestone Expressway in 1964, at the cost of several buildings and the Malba entrance gate. College Point was originally settled by the Native American Matinecocks. The Indians sold much of it to New Netherland Governor William Kieft in 1645. William Lawrence was the first British settler (College Point Boulevard’s name until 1969, Lawrence Street, honored the Lawrence family) and by 1838, Augustus Muhlenberg, rector of St. George’s Church on Main St. in Flushing, had founded St. Paul’s College in the area. The college foundered within a decade, but College Point and College Place recall it. Rubber manufacturer Conrad Poppenhusen’s philanthropy and good will was, in good measure, responsible for College Point’s early development. The Poppenhusen Institute, built in 1868 at what is now 14th Rd. and 114th St., featured the nation’s first free kindergarten, as well as a justice of the peace, the first home of the College Point Savings Bank, German singing societies, the first library in the area, a court room, the Sheriff's Office with two jail cells, and a grand ballroom. Today the Institute is used as a community center and features karate and piano lessons, summer band concerts, a fire department museum and Native American exhibits, while the ballroom is rented for wedding receptions. They’re perpetually hard up for funds, so why not visit in person or at poppenhuseninstitute.org and leave a donation. The Institute celebrates its 150th anniversary this year.